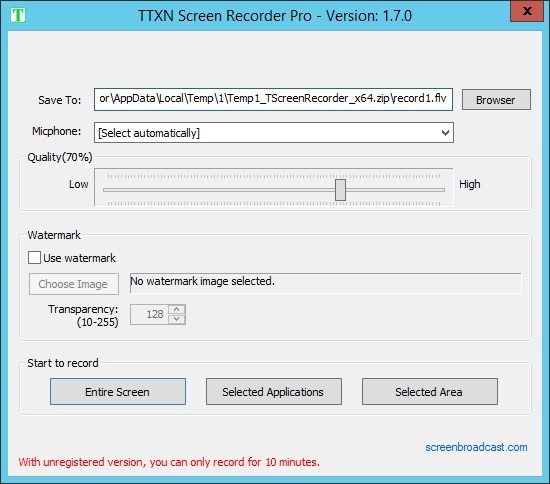 TTXN Screen Recorder can record full size or partial screen, mouse cursor and audio to flv or mpegts video file which can be easily published on internet and played in flash player. Record entire screen, or select a region to record, or select one or more applications to record. You can draw lines on screen during recording. and can change line width and color. Watermark supported. You can choose a picture to use as a watermark, change the position and transparency of it. TTXN Screen Recorder is very easy to use and very small. It's a portable application, so you don't need to install it. There is only one file in downloaded package. Please extract it to a directory and run it. It will automatically generate a default video file name for you, so you even don't need to do any additional steps to record screen. After you end the recording, it will also generate next default file name. If you are not sure of your system type, please download 32bit version, it will always work. If the Windows Smartscreen popup to prevent from starting, please click 'More info', then click button 'Run anyway'. Our software does not harm to your computer.